I’ll Sell You Mine For The Bargain Price Of $200!! What am I talking about? The sunburst mirror I made last week, of course! Oh, come on. I think that’s quite a bargain, considering that this one from Ballard Design is $349!! Yes, it’s true…the one from Ballard is a whopping 48 inches in diameter. That thing is HUGE! So that’s why I’m willing to make you such a great offer on my 22 inch sunburst mirror. Oh, I’m kiddin’. Mine’s staying right here. But you can make your own for about $30! But I really am wondering…who would pay $349 for such a thing? Would YOU?! 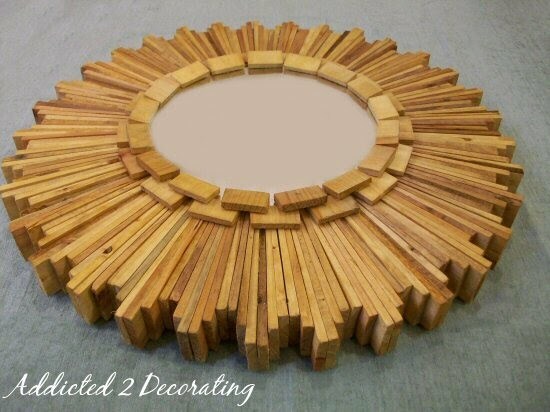 A few of you mentioned wondering what this wood shim sunburst mirror would look like painted. Well, thanks to A2D reader Denise, you don’t have to wonder anymore! She uploaded her own painted version of the wood shim sunburst mirror to the A2D Facebook page, and it looks AMAZING!!! Pretty incredible, right?! I love how it turned out. And I’m amazed at what a drastic difference the paint makes!! Now I know that several of you said you were going to try this project. How’s that going? Do any of you have a finished sunburst to show off, or is Denise at the head of the class? 🙂 If you have one to show off, e-mail me a photo, or post it to the A2D Facebook page. I’d love to see it!! Now back to my question…would you pay $349 for something like that to hang on your wall? I’m pretty sure we all know what my answer would be!! Previous Post There's No Turning Back Now!! Next Post I Think My List Is Getting LONGER!! When you factor in the time it took to make it, it's worth $349 unless you work for pennies on the dollar. That's why it's hard to make money selling handcrafted items. It's hard not to devalue the time you spend to come up with a price that will sell. I think you're worth at least $349! I agree with Sally – it's hard to make money selling handcrafted items, unless you don't factor in the hours of work you've put into making anything. Painting the shims different colors first then assembling them would make this design suitable for almost all color schemes. You're upscaling shims. Maybe someday giving someone a 'wedgie' will no longer be a bad thing? Love the painted version, too. She's definitely at the head of the class. 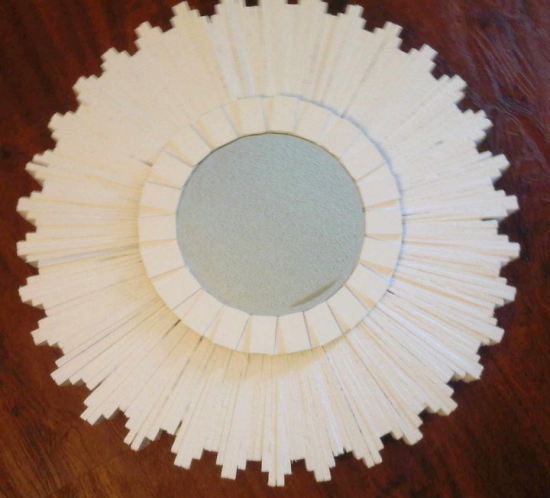 I have the supplies to make the sunburst mirror Janell featured on her blog and still haven't made it! In my defense, I'm still looking for the perfect bench for my entry to hang it above :). I'm going to Home Depot this afternoon to buy shims, I swear. I've been oohing and ahhing over yours since this weekend. I may try the Ballard Design one, because of the weight of yours and the depth issue with the space I want to put it in. Would you have any idea how many shims it would take? I would NEVER spend $350 on a mirror, much less a 48" starburst mirror. And I still want to attempt one of these, but have no time right now!! I think I've decided that I'm going to try out this project of yours… hmmmm, perhaps with a little twist? A-dorable! Shims are now on my shopping list! That mirror better be made of solid gold for me to pay that much. No, I'd never pay that much for a mirror, although yours is worth $200. I just got a couple of big mirrors from Home Depot for $15 each that I'm working with. Love your sunburst & will be attempting my own when I get a break from glass projects. Thanks for a great site. No way would I be spending 300+ dollars for that!! Or any other mirror really 🙂 Id rather put my own touch on one. I love it and think its worth the money! never, ever, ever would I pay that much for a mirror, or for ANY type of accessory for that matter. Sunburst mirror with Ballard Design no doubt looks amazing and pretty when hung on the wall, but the price is too expensive I would like to keep my budget below $200.00 Rather than spending $349.00 on a mirror. Oh to live in a life where I could spend $350 on a mirror! Thank you for inspiring us and helping build a family home on a normal budget. You rock!